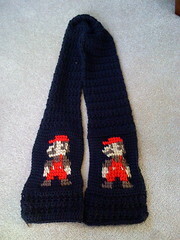 My husband wanted a hat with Mario on it-I was unable to get my idea for a hat to work, but I thought, I could so do it as a scarf! 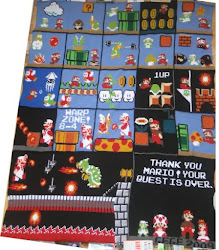 Thus the Mario scarf was born. Even though I had the concept down correctly, I did not know how to change colors correctly- there were huge holes in between my color changes. I'll show an example of this in just a bit. Then, I did the second panel- needed to have a Goomba and a Koopa Troopa! 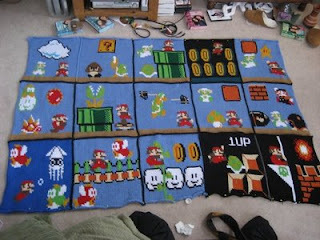 With each blanket or purse I finished, my husband would sigh, look longingly at my Mario panel pile, and say, "One of these days, I'll have a blanket of my own...." I wanted to finish this blanket soooo badly, but was not satisfied with some of the panels. The last one I worked on was the underwater panel; however, when I counted the rows (height) after completing it, one side had 50 rows and the other had 49....oops. I had mistakenly started a first pass with a row when I hadn't finished the second pass of the previous row. (Each row of Tunisian crochet has 2 passes- the forward pass and the backward pass- in order to make the stitches square.) I was sooooo bummed. As I mentioned before, if something doesn't come out right, I put it aside. Well, I put this blanket aside for about 8 months because of that. I didn't have the heart to tear back 15 rows and re-do them. Well, all that changed at the beginning of 2009. I decided that this was the year I was going to finish this blanket, so I started in earnest. Well, now that I knew how to change colors correctly, I had to redo 4 of the previous 7 panels that came out all wonky. Ugh. But, it really was soooo worth it! There were 2 other panels that I had to redo- not because of the mistakes in color changes (I had learned how to do it with the underground coin panel), but because I found the right colors to use for Mario's skin and for the "skin" of the enemies. So, even though I started a year and a half ago, every single panel that is now on the blanket, except for the coin cache one, has been completed since February 2009. This first panel actually didn't look so bad. However, I did have some issues with my tension, which is why it's so much smaller than the newer one. However, the character definition, and even the cloud, is so much better in the newer one. Changing colors correctly is soooo important! This one I knew I had to redo....if only to correct Luigi's hat. Erg. You can see how malformed the pipe is (due to incorrect color changes) and how much more the color pops in the second one. Also, I had originally crocheted the turtle shell by using a screen shot of the whole turtle and taking off the head and legs. I then found this awesome site that has all of the characters on there...including the correct turtle shell! Mario comes out of the coin cache and steals the star Luigi was about to use. Life isn't fair for Luigi.... This is actually the first of the new panels that I made in February. Ever since the beginning, I knew that Luigi couldn't stay forever....this was Mario's quest. I loved the idea of him being trapped between a Bullet Bill and a Buzzy Beetle! However, the star panel above was not part of my original design. I decided to add that during the blanket reboot. So, since I had to redo this panel anyway due to the wonkiness, I decided to replace the question block with a brick, and to have Mario as star Mario. Oh yes- Luigi has to take one for the team! This panel makes me laugh- poor Luigi! Game over for you, chump! And, to add insult to injury, that innocent looking brick actually contained a 1UP mushroom for Mario- hahahahaha! The Lakitu and Spiny panel. The original is on the right and was my favorite of the original panels. I did the color changes correctly and I LOVED it. Then, I realized that the colors weren't correct....then I realized that I had Mario in that same pose for a few panels in a row....BORING. So, I changed the colors (MUCH better!) and put Mario in a skidding stop right before he could slide into a Spiny. Whew! After surviving Lakitu, Mario goes underwater. The original one is on the left. I ripped back the 15 rows to correct my goof from a year ago....then I realized that I needed to change the Cheep Cheeps' color to make them pop. But, the good thing is that I got to add the air bubble that I wanted to add originally but forgot and, again, didn't want to rip back so many rows to fix. I changed the red and green Cheep Cheeps' positions b/c of the following panel. Flying Cheep Cheeps! Since the red one was on the bottom left, I decided to have the green underwater Cheep Cheep on the bottom right....crazy? Maybe.... I LOVE this panel. The bridge just makes it....WOW. I LOVE THIS ONE! This is the cutest of the bunch. 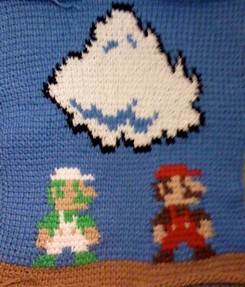 :) Mario now gets to go to Coin Heaven...atop the "teeth clouds" as my mom would call them. :) Now, astute gamer geeks will know that in world 3-1, just prior to hopping the turtle (next panel), Mario does get to go to Coin Heaven. I debated whether or not to make this a black panel since world 3 is a night-time world. However, I had always pictured this blue! I LOVE IT! Awww yeah....my true SMB geekiness shines through. Getting infinite free men by hopping the turtle. I LOVE THIS GAME! I'm going to continue the story in one more post. This one is just about filled to the brim.....The end of the quest is in sight! Oh my gosh! I can't wait to see the rest!! That's crazy!! Are you going to make the 1st-round panels into their own throw or something?? Found via Geek Central Station. Thank you both!! Heather- I actually did crochet the original underwater and Lakitu scenes into a pillow...I even took pictures...but then got so involved in my blanket post that I forgot to put that in there. oops. My next post will have those pictures and a sort of FAQ from all the questions I've been getting. 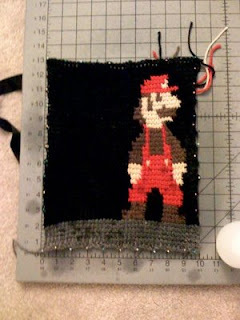 Mario Bros, Crochet*, and Gilmore Girls?! I don't think there's a better combination in the world!! *ok, I'm a knitter so I'd replace that bit with knitting. That is amazing! Would you be willing to share the pics you used? Where have you learned to do "proper color changes". I recently taught myself to do Tunisian style crochet but noticed my color changes look rather sloppy, and yours look very crisp. Any insight would be appreciated. This is so amazing!!! I first saw the blanket for your brother and my son (hes 6) fell in love with it. Then when i saw this one i could not believe you toped the other one......but you did. I am amazed at your talent!!! !Is it hard to come up with your own designs? I have been crocheting for years and never tried. wow--how did you come up with the pattern design? Do you have software or do you just kind of wing it? Because these are amazing! Thanks, Sparky! Nope- no software- if you check out the videos I posted on Tunisian crochet, you can see some of my graphs/charts used. :) yep- I basically just winged it! TRUE LOVE, you have it in so MANY ways. I guess I am not the only one to crochet in my sleep. 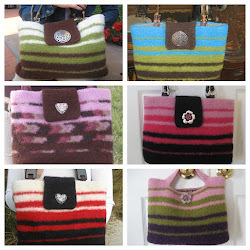 I was wondering how you felt your Tunisian pieces and how you determine hook size and finished size pre-felting. Thanx for sharing the love. Thank you, Stephanie! :) When it comes to felting, I do it the same way as my other felting projects- just chuck it in the wash with an old pair of jeans, hot water, and detergent. 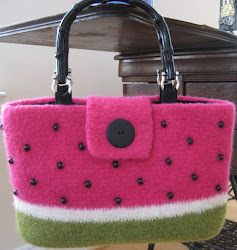 I always use a "J" hook for felting projects- including a "J" tunisian hook. I've found that using Patons Wool my projects shrink by a 1/3, so I think how large I want my FO and do some maths (hopefully non-fuzzy), cross my fingers, and go from there. Usually works very well! Will this method work with a front-loader washer? I tried to felt a hat in it and it just got slapped around a lot...finally had to hot/cold it in my dishpan. You've opened up many new horizons with your videos and website. When you're not busy, you should write a novel. Thus the name change. I'd post pics if I knew how. So far my projects are of other crochet patterns/ideas that I've admired and then converted to my Tunisian version or a combination of techniques for texture and dimension. I've been looking for a skin color yarn...what did you finally find for Mario? I´m also waiting eagerly for the new photo updates. I want to see up close to! =D It´s so amazing! Out of curiosity, is there some place that you have posted all of the pics into an album? Most of the pics that I am assuming are supposed to be part of this post are missing from it. There are just big, blank spaces where the pics should be. I was just stopping in to say hello, WOW!, and request for the panels again please! Your blanket is SUPER AWESOME. Thank you! LOVE all of your designs! Ahh, this is so inspiring. I really hope you find time to upload the panels again! !